William M. Gallagher (1923 – 1975) was a photographer with the Flint Journal in Flint, Michigan for 27 years. 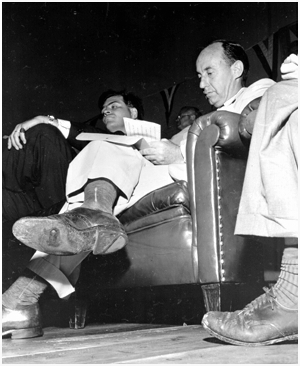 Gallagher was awarded the 1953 Pulitzer for his photograph of 1952 presidential candidate Adlai Stevenson seated on a platform with Michigan Governor Ge Mennen Williams. Gallagher had waited for a good shot in front of Adlai Stevenson during his election campaign. He later recalled “As I was kneeling there he started going over the notes of his speech and casually crossed his legs. This brought the shoe up right in front of me. I couldn’t miss seeing the hole. As quietly as I could, I pre-focused my camera and set it on the floor at arms’ length. I had to spot the camera by guesswork because it was impossible for me to lie on the floor. 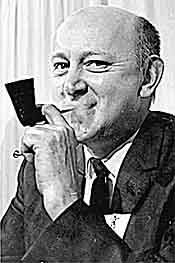 Gallagher didn't take the photo seriously and didn't think the Journal would publish it since they endorsed Stevenson's Republican opponent Dwight D Eisenhower, so he gave it to his editor saying "I just finished this for the hell of it. I don't suppose a Republican paper would want to use it." However, the Journal ran the photo on the front page. The New York Times wrote that Gallagher's photo was "one of the outstanding pictures of the campaign", perhaps because it contrasted with Stevenson's serious, patrician image. Stevenson was sent an "avalanche" of shoes by people who saw the image. When Gallagher won the Pulitzer Stevenson sent him a telegram reading "Glad to hear you won with a hole in one." On one occasion Gallagher was sent to cover a crime scene, crossed police barriers and hopped into a running police helicopter. Motioning for the pilot to take off as if he were the person the chopper was expecting, the pilot left for the scene. He obtained pictures that no one else was able to. Gallagher died of meningitis at age 52. Monday Pic, and more. . .